The Pocket Superheroes created a great deal of vehicles but despite best efforts the series never got into the playsets like the Comic Action Heroes had. Perhaps buyers were skiddish on giving up too much shelf space or the amount of recycled ideas might have just been too much. The only playset produced for the Pocket Heroes was the Batcave a styrene wonder that shared it’s design with the Bridge playset from the Star Trek: The Motion Picture line. 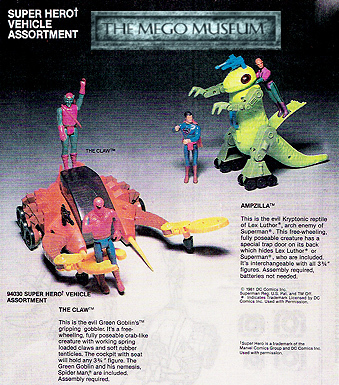 The Claw set (with Spidey and Green Goblin) and Ampzilla (with Luthor and Supes) are great examples of how Mego seemed to be having a dry run creatively with the Pocket Superheroes, both of these items were pitched as Micronaut Vehicles. Mego did make some interesting play set attempts including a cool City Play set for Hulk and Spider-man but sadly these items were rejected by buyers. It’s hard to say what killed the pocket heroes, lack of creativity or lack of interest in Superheroes in general, either way, it’s playsets and vehicles are very dysfunctional.